The unit of currency is the Malawian kwacha (MWK). This is divided into 100 tambala (t). 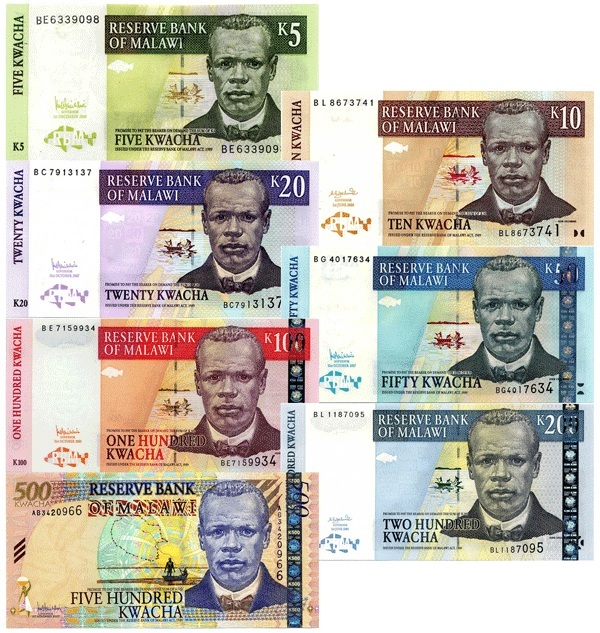 Bank notes include MWK500, MWK200, MWK100, MKW50, MKW20, MKW10 and MWK5. Coins include MWK10, MWK5, MWK1, 50t, 20t, 10t, 5t and 1t, although the small tambala coins are virtually worthless. Should you receive any coins, even the MWK10 coin, please limit the use of these coins to commercial transactions with establishments like Metro or Shop-Rite. In general it is considered an insult to use coins in personal transactions with street vendors and tailors. You may exchange your currency at any Malawi Bank or the Foreign Exchange (ForEx). The prevailing rate can be found on the XE Live Exchange Rates website. To keep your money and other valuables (such as your passport and air tickets) safe from pickpockets, the best place is out of sight under a shirt or skirt, or inside your trousers. You can make or buy a pouch that goes around your neck or waist. Some travelers go for “invisible pockets,” money belts and other imaginative devices. Keep the bulk of your money here, and then use a separate wallet with just a little money in for day-to-day purchases. Avoid the mistake some travelers make of keeping their money carefully hidden but then expose the lot when buying a ticket in a crowded bus station. Your Malawian hosts will take good care of you. Keep a low profile; it’s best to not wear any jewelry; do not take a lot of money or pull it out and “flash” it around. Do not go anywhere by yourself and do not go anywhere without a Malawian host. Pray and trust God for His protection. Malawi has a single wet season, which runs from mid-October or early November to mid- or late April, and a dry season from May to October/November. During the wet season daytime temperatures are warm and conditions humid in low areas, although much less rain falls along the shores of Lake Malawi than in the highlands. The dry season is cool from May to August, with July being the coolest month. At the end of the dry season, during September and October, or until the rains start, it can become hot and humid at midday, especially in low areas. Daily temperatures in the lower areas do not fluctuate much, with average daytime maximums around 70°F in July and 78°F in January, although dry season highs of 102°F have been recorded in the Lower Shire Valley. In the highland areas, average daytime temperatures in July are usually between 50°F and 59°F, while in September they get up to 68°F and above. Night temperatures on the highlands are low, sometimes dropping below freezing on clear nights in July. Malawi’s time is GMT/UTC +2. The country does not have daylight saving. When it’s noon in Malawi, it’s 5:00 AM in Pittsburgh, EST and 6:00 AM DST. The Google™ Map above approximates day and night around the world. The flag marked "P" represents the location of Pittsburgh Presbytery Offices. The flag marked "B" represents the location of the Blantyre Synod Offices. If you have been given a phone number to contact anyone in Malawi, please consider the time differential before making phone calls. The number one rule is be careful of the water and especially ice. If you don’t know for certain that the water is safe, assume the worst. Reputable brands of bottled water or soft drinks are generally fine, although in some places bottles may be refilled with tap water. Only use water from containers with a seal. Take care with fruit juice, particularly if water may have been added. Milk should be treated with suspicion, as it is often unpasteurised, though boiled milk is fine if it is kept hygienically. Tea or coffee should also be OK, since the water should have been boiled. Before eating, a member of the family may pass around a bowl of water, or jug and bowl, for washing hands. If it comes to you first as honored guest and you’re not sure of the routine, indicate that the bowl should be taken to the head of the family, then do what they do when it comes to you. The African staple, maize meal (nsima), is the center of nearly every meal. It is normally taken with the right hand from a communal pot, rolled into balls, dipped in some sort of sauce – meat gravy or vegetables – and eaten. Malawi is still a very conservative country. As a general rule, dress simply, neatly and conservatively. Women - Dresses or a skirt and a blouse; no slacks, tops with spaghetti straps, tank tops or tube tops. It is best to wear blouses or T-shirts with sleeves (either short or long). Men - Slacks and sport shirts. Sport coat and tie for church and formal partnership occasions. Pastors - Collar for any Church or official function. It is preferable that you wear a collar at most times. Shoes - Open toed shoes (while comfortable) allow your feet to get very dirty. Sturdy walking shoes are a better choice. Sneakers or hiking shoes are OK for casual wear. Dress shoes for Church functions. Follow the lead of your hosts in all matters of dress and etiquette. Pay attention to appropriate “cues” for male/female interaction. You may need to be more “submissive” than you are used to being. Pack sanitary supplies whether you expect to need them or not. Try to use all paper products. Pack LOTS of zip lock bags—you may need to tote your trash for a long time! Hand sanitizer, baby wipes, etc. Pack toilet paper. There is often an issue of trash and where to dispose of it. Potential lack of privacy issues takes some getting used to. Excerpts taken from Malawi, published by Lonely Planet.